Lunokhod – FOP Shvachko V. V.
Lunokhod is a series (Lunokhod-0, Lunokhod-1, Lunokhod-2, Lunokhod-3) of the Soviet remote controlled self-propelled apparatuses for exploration of Moon. History of the creation of Soviet automatic mobile laboratory for the study of the Moon begins from the first half of 1960s. In 1963, S. Korolyov (Soviet scientist, designer and organizer of the production of the rocket-space technics and missile weapons of the USSR, the founder of the practical astronautics) attracted the VNII-100 (which later will obtain name – All-Union Scientific Research Institute of Transport Mechanical Engineering, VNIItransmash – local abbreviation) to this work. 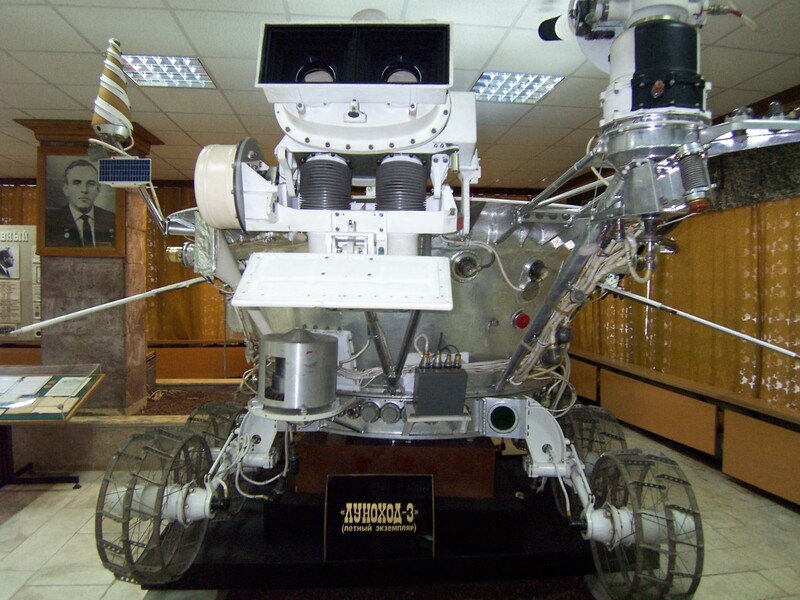 Moon rovers were created in the design office of Machine-building plant named after S. Lavochkin under the direction of G. Babakin. The self-propelled chassis for Lunokhod was created under the leadership of A. Kemurdzhian in the VNIItransmash, which were developed the chassis of the Soviet tanks before. Organization was also charged with developing of the self-propelled chassis with motion control and security system with the set of information sensors. The conceptual design of the Lunokhod was approved in autumn 1966. All design documentation was ready at the end of 1967. Control of the Moon rovers was fulfilled by group of operators from 11 people who worked (in shifts) as the control team: commander, driver, operator of high gain antenna, navigator, flight engineer. The control center was located near the Simferopol city in Crimea. Lunokhod-0 was lost during the failed rocket launch on February 19, 1969. Lunokhod-1 was delivered to the surface of the Moon on November 17, 1970 by the Soviet interplanetary station Luna-17, launched on November 10, 1970. Lunokhod-1 was the first roving remote-controlled robot to land on another celestial body. 1 – container; 2 – radiator-cooler; 3 – solar battery; 4 – TV cameras; 5 – telephotometer; 6 – the motor-wheels; 7 – drive of the sharp directional antenna; 8 – sharp directional antenna; 9 – little directional antenna; 10 – pin antenna; 11 – radioisotope heat-generator; 12 – dimensional wheel; 13 – device of maneuverability estimation; 14 – corner reflector. Lunokhod-1 was used within 10.5 months – until October 4, 1971 (more than three times longer than planned). During this time it passed 10540 m, what allowed to do the detailed survey on the lunar surface area of 80000 m2. More than 200 panoramas and 20000 images of the lunar surface were obtained with the help of television systems of Lunokhod-1. The soil was penetrated at 500 points in order to obtain the parameters of its physical and mechanical properties. The analysis of the chemical composition of the soil was made in 25 points of the surface. The average distance between the centers of the Earth (mean radius – 6371 km) and the Moon (mean radius – 1737.1 km) is 384467 km. The corner reflector was set on the “Lunokhod-1” for making the experiments for the accurate determination of the distance to the Moon. Reflector of Lunokhod-1 provided about 20 observations in the first 1.5 years, but then its exact location was lost. In March of 2010 Lunokhod-1 was discovered by researchers at the pictures of Lunar Reconnaissance Orbiter (NASA robotic spacecraft currently orbiting the Moon on a low 50 km polar mapping orbit). In April of 2010 group of American scientists from the University of California at San Diego has reported about receiving the laser beam reflected from the reflector of Lunokhod-1 for the first time since 1971. Lunokhod-2 was delivered to the surface of the Moon on January 16, 1973 by the Soviet interplanetary station Luna-21, launched on January 11, 1973. 1 – solar panel; 2 – photodetector; 3 – sharp directional antenna; 4 – top TV camera; 5 – magnetometer; 6 – corner reflector; 7 – astrophotometer; 8 – lower TV camera; 9 – “Rifma” remote unit of equipment; 10 – telephotometer; 11 – device of maneuverability estimation. 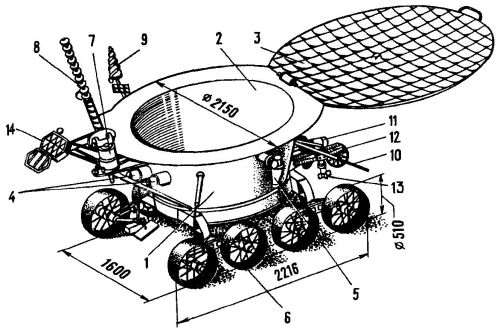 The overall layout and design of the basic units of Lunokhod-2 are similar to Lunokhod-1. The navigation equipment and control system of sharp directional antenna were improved. One of the television cameras had been installed at a height of eye of a standing person. In addition, the frequency of frame transmitting from cameras was increased. Scientific equipment was supplemented by astrophotometer and magnetometer. The mass of Lunokhod-2 was 840 kg. In total, during the work on the Moon, equal to 125 days, the Lunokhod-2 passed 37.45 km. In this way the motion was held on the planetary terrain with more difficult relief than Lunokhod-1 had. 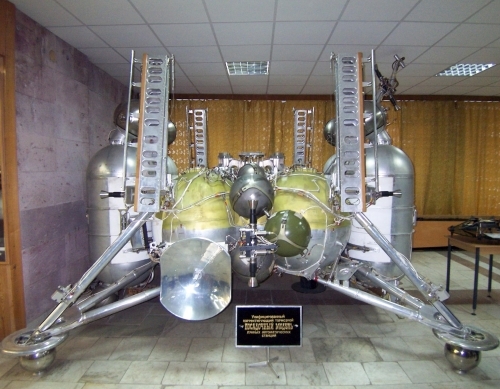 In December 1993 Lavochkin Association sold Lunokhod-2, located on the Moon, along with the AMC Luna-21 at Sotheby’s in New York for son of astronaut entrepreneur Richard Garriott, which is also made in October 2008, the flight to the International Space Station as a space tourist on board the Soyuz TMA-13. Start of Lunokhod-3 (scheduled for 1977, Luna-25) did not take place, now it is in the museum of Lavochkin Association. 1. Луноход (космическая программа). — Mode of access: http://ru.wikipedia.org/wiki/%D0%9B%D1%83%D0%BD%D0%BE%D1%85%D0%BE%D0%B4 . 2. Місяцехід. — Mode of access: http://uk.wikipedia.org/wiki/%D0%9C%D1%96%D1%81%D1%8F%D1%86%D0%B5%D1%85%D1%96%D0%B4 . 3. 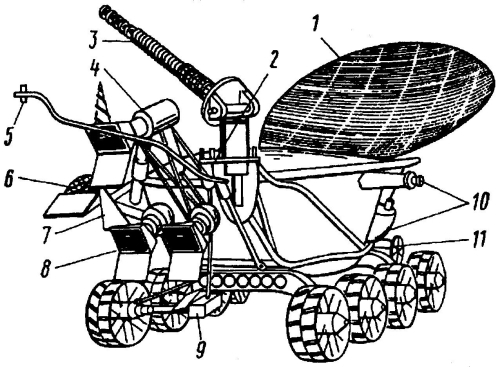 Lunokhod programme. — Mode of access: http://en.wikipedia.org/wiki/Lunokhod . 4. Luna 17/Lunokhod 1. — Mode of access: http://nssdc.gsfc.nasa.gov/nmc/masterCatalog.do?sc=1970-095A . 5. Luna 21/Lunokhod 2. — Mode of access: http://nssdc.gsfc.nasa.gov/nmc/masterCatalog.do?sc=1973-001A . 6. 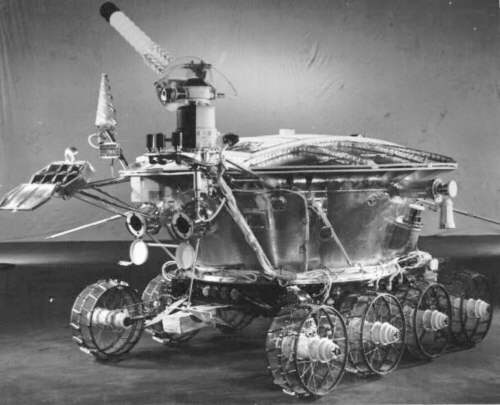 The Lunokhod 1 Rover. — Mode of access: http://nssdc.gsfc.nasa.gov/image/spacecraft/lunokhod.jpg . 7. Луноход-1. — Mode of access: http://ru.wikipedia.org/wiki/%D0%9B%D1%83%D0%BD%D0%BE%D1%85%D0%BE%D0%B4-1 . 8. Луноход-1. — Mode of access: http://uk.wikipedia.org/wiki/%D0%9B%D1%83%D0%BD%D0%BE%D1%85%D0%BE%D0%B4-1 . 9. Lunokhod 1. — Mode of access: http://en.wikipedia.org/wiki/Lunokhod_1 . 10. Луноход-2. — Mode of access: http://ru.wikipedia.org/wiki/%D0%9B%D1%83%D0%BD%D0%BE%D1%85%D0%BE%D0%B4-2 . 11. Lunokhod 2. — Mode of access: http://en.wikipedia.org/wiki/Lunokhod_2 . 12. Луноход-3. — Mode of access: http://ru.wikipedia.org/wiki/%D0%9B%D1%83%D0%BD%D0%BE%D1%85%D0%BE%D0%B4-3 . 13. File:Lunokhod-3 back.jpg. — Mode of access: http://commons.wikimedia.org/wiki/File:Lunokhod-3_back.jpg . 14. Корольов Сергій Павлович. — Mode of access: http://uk.wikipedia.org/wiki/%D0%A1%D0%B5%D1%80%D0%B3%D1%96%D0%B9_%D0%9A%D0%BE%D1%80%D0%BE%D0%BB%D1%8C%D0%BE%D0%B2 . 15. Королёв, Сергей Павлович. — Mode of access: http://ru.wikipedia.org/wiki/%D0%9A%D0%BE%D1%80%D0%BE%D0%BB%D1%91%D0%B2,_%D0%A1%D0%B5%D1%80%D0%B3%D0%B5%D0%B9_%D0%9F%D0%B0%D0%B2%D0%BB%D0%BE%D0%B2%D0%B8%D1%87 . 16. Sergei Korolev. — Mode of access: http://en.wikipedia.org/wiki/Sergey_Korolyov . 17. Бабакин, Георгий Николаевич. — Mode of access: http://ru.wikipedia.org/wiki/%D0%91%D0%B0%D0%B1%D0%B0%D0%BA%D0%B8%D0%BD,_%D0%93%D0%B5%D0%BE%D1%80%D0%B3%D0%B8%D0%B9_%D0%9D%D0%B8%D0%BA%D0%BE%D0%BB%D0%B0%D0%B5%D0%B2%D0%B8%D1%87 . 18. НПО имени С. А. Лавочкина. — Mode of access: http://ru.wikipedia.org/wiki/%D0%9D%D0%9F%D0%9E_%D0%9B%D0%B0%D0%B2%D0%BE%D1%87%D0%BA%D0%B8%D0%BD%D0%B0 . 19. ФГУП «Научно-производственное объединение им. С. А. Лавочкина». — Mode of access: http://www.laspace.ru . 20. Кемурджиан, Александр Леонович. — Mode of access: http://ru.wikipedia.org/wiki/%D0%9A%D0%B5%D0%BC%D1%83%D1%80%D0%B4%D0%B6%D0%B8%D0%B0%D0%BD,_%D0%90%D0%BB%D0%B5%D0%BA%D1%81%D0%B0%D0%BD%D0%B4%D1%80_%D0%9B%D0%B5%D0%BE%D0%BD%D0%BE%D0%B2%D0%B8%D1%87 . 21. ОАО «ВНИИтрансмаш». — Mode of access: http://www.vniitransmash.ru/ . 22. Посадочная ступень Лунохода. — Mode of access: http://img-fotki.yandex.ru/get/10/woinaroffski.0/0_7a8c_6e4b6ccb_orig . 23. NASA – Soviet Union Lunar Rovers. — Mode of access: http://www.nasa.gov/mission_pages/LRO/multimedia/lroimages/lroc-20100318.html . 24. Soviet Union Lunar Rovers. 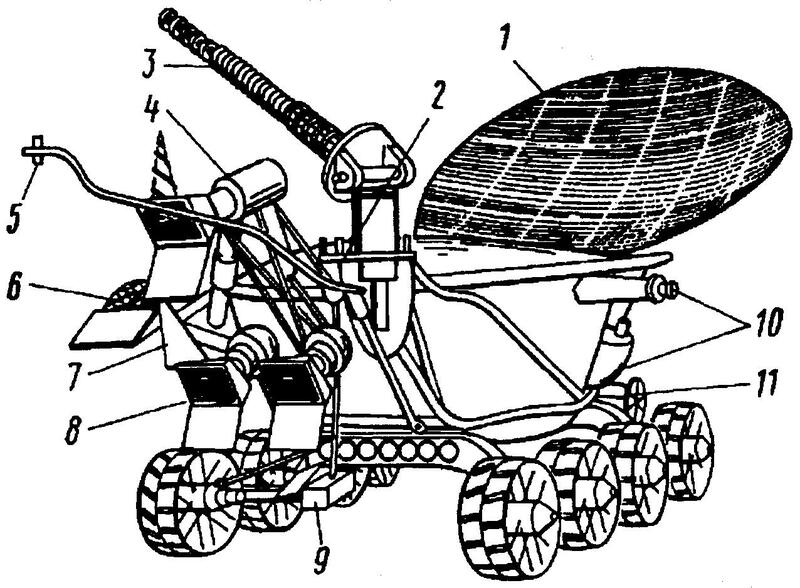 — Mode of access: http://lroc.sese.asu.edu/news/index.php?/archives/198-Soviet-Union-Lunar-Rovers.html . 25. NASA – Lunar Reconnaissance Orbiter (LRO). — Mode of access: http://www.nasa.gov/mission_pages/LRO/main/index.html . 26. Lunar Reconnaissance Orbiter. — Mode of access: http://en.wikipedia.org/wiki/Lunar_Reconnaissance_Orbiter . 27. Lunar Reconnaissance Orbiter. — Mode of access: http://ru.wikipedia.org/wiki/LRO . 28. Lunar Reconnaissance Orbiter. — Mode of access: http://uk.wikipedia.org/wiki/LRO . 29. UCSD Physicists Signal Long Lost Soviet Reflector on Moon. — Mode of access: http://lunarscience.arc.nasa.gov/articles/ucsd-physicists-locate-long-lost-soviet-reflector-on-moon/ . 30. Tank on the Moon. — Mode of access: http://science.discovery.com/tv/tank/tank.html . 31. Планетоходы / А.Л. Кемурджиан, В.В. Громов, И.Ф. Кажукало [и др. ]; под ред. А.Л. Кемурджиана. — [2-е изд.]. — М.: Машиностроение, 1993. – 400с. 32. Angelo, Joseph A. Robot spacecraft / Joseph A. Angelo, Jr. – New York: Facts On File, Inc., 2007. – 306 p. – ISBN 0-8160-5773-7. See also: Teletank, STR-1 Specialized transport robot. 2 Author released this work into the public domain. 3 Dimensions are in millimeters.